The podcast world has exploded in the last couple of years (thank you, Serial), with content that spans news, professional or personal development, and pure candy. In Episode 53, Christine and Asha share about 13 great podcasts that are loaded up in their playlists right now. + + + + + Christine Koh and Asha Dornfest are the co-authors of MINIMALIST PARENTING and the award-winning bloggers behind BostonMamas.com (CK) and ParentHacks.com (AD). 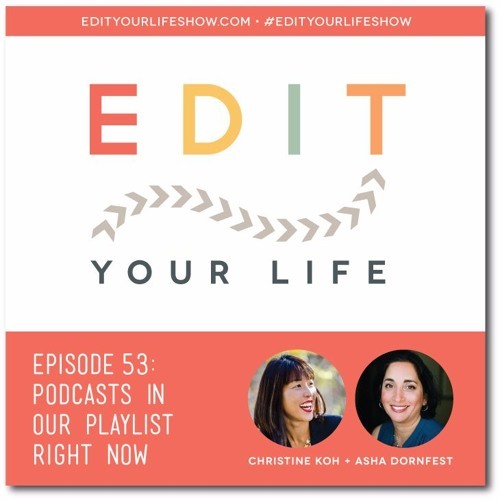 You’ll find the show notes for this episode, including links to resources we’ve mentioned, at http://edityourlifeshow.com. Do you have a question, comment, or show topic idea for us? Would you like to sponsor an upcoming episode? We’d love to hear from you. Send an email to edityourlifeshow@gmail.com, or leave a comment at facebook.com/edityourlifeshow.